Building muscle strength does not mean that you need to spend every waking moment in the gym. While building muscle strength does require spending some time spent in the gym, there are changes you can do in your daily routine outside of the gym as well. When working out to build strength you need to predetermine whether or not you also want to build bulk. 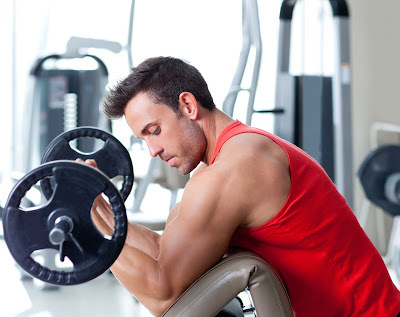 You can add strength without building bulk by limiting the number of repetitions you do. Limiting your cardio workouts will also improve strength. You should limit the cardio sessions to once or twice a week with a maximum of 30 minutes moderately paced sessions. Tip #1 – Lengthen your body. Stretch it out. When you stretch out or up and make your body long you increase the difficulty in moving. This causes resistance which will help to increase your strength. Increase the distance of your body movements when performing an exercise. Place a book under your hands or feet while you do lunges or pushups or if you have stairs in your home place your hands or feet on the stairs to increase the difficulty of performing the exercise, which uses more muscle and builds more strength. Tip #2 – When beginning to exercise to build strength, most people want to start working their weak muscles immediately. The fastest way to build strength throughout your body is to focus first on the largest muscle groups. Build your core first and then proceed to weaker muscles. Tip #3 – Instead of doing a full sit up, only lift your torso up half way or less to increase the strength in your abdominal and back muscles. Tip #4 – Lower the number of repetitions you do. By doing this, you can increase the amount of weight you lift, the muscle strength used in a particular exercise and you recover faster. Lower repetitions build strength without adding mass to your muscle. If you want to add mass, increase the number of repetitions you do of each exercise. Tip #5 – When you reach the lowest position in a lunge or pushup, pause to a count of 5 and hold it there. This increases the amount of strength it takes to lift your body back up. Tip #6 – Force your body to work at balance while exercising. When able to do so, lift one foot into the air. Forcing your body to balance uses muscle strength increasing that strength. Tip #7 – Twist or rotate your body while you are doing your usual workout. Adding a twist of the torso when you are doing a sit up or a lunge can quickly add to your strength. Tip #8 – Time your Rest Periods – Take very short rest periods throughout your exercise program. If you take extended rest periods you are not getting the full benefit from the workout. Tip # 9 – 2 hours before exercise eat a combination of protein and carbohydrates. Protein helps build muscle and the carbohydrates will give you increased energy to burn during your workout. Tip #10 – After completing your workout drink a protein drink. Protein helps build and repair muscle. This can be a sports drink that is high in protein or a whey protein powder that is mixed with skim milk.